"Pomanders are one-of-a-kind, no-bake chocolate cookies. This recipe has been handed down from many generations in our family. As a tradition, Grandma has made Pomanders for us nearly every Christmas, but they are great year-round! The longer you let these no bake cookies set the better they taste. 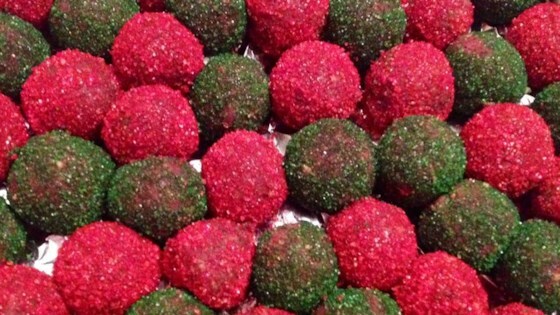 So, make them a few weeks before you plan to eat them, hide them from your family and friends, and have patience! Store in tight containers for two to three weeks to let the flavors fully cultivate and intensify. You can eat these right after they're made, but for best taste let them sit at least two weeks." Combine the chocolate chips, sugar, corn syrup, and water in a glass or metal bowl. Place the bowl over a pot of simmering water to melt the chocolate chips, stirring occasionally. Once the chips are melted, stir the orange flavoring into the mixture and remove from the heat. Meanwhile, mix together the vanilla wafers and hazelnuts in a bowl; set aside. Pour the chocolate mixture into the bowl; mix until evenly coated. Shape the mixture into small balls; decorate with the candy sprinkles. Not a knock-out. Probably won't make again. Expected them to be tastier! This recipe is similar to one my mother made for decades--we use orange juice, walnuts, and roll in regular sugar. Love them. This was a great recipe, and I had a number of people ask me for the recipe and we're impressed with how simple they are to make.